§ 14. When that servant of the Lord, Boisil, saw that Cuthbert was restored, he said, “You see, my brother, how you have recovered from your disease, and I assure you it will give you no farther trouble, nor are you likely to die at present. I advise you, inasmuch as death is waiting for me, to learn from me all you can whilst I am able to teach you; for I have only seven days longer to enjoy my health of body, or to exercise the powers of my tongue.” Cuthbert, implicitly believing what he heard, asked him what he would advise him to begin to read, so as to be able to finish it in seven days. “John the Evangelist,” said Boisil. 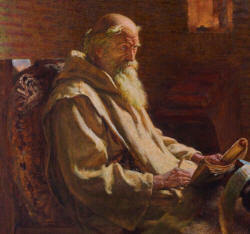 “I have a copy containing seven quarto sheets: we can, with God’s help, read one every day, and meditate thereon as far as we are able.” They did so accordingly, and speedily accomplished the task; for they sought therein only that simple faith which operates by love, and did not trouble themselves with minute and subtle questions. After their seven days’ study was completed, Boisil died of the above-named complaint; and after death entered into the joys of eternal life. They say that, during these seven days, he foretold to Cuthbert everything which should happen to him: for, as I have said before, he was a prophet and a man of remarkable piety. And, moreover, he had three years ago foretold to Abbot Eata, that this pestilence would come, and that he himself would die of it; but that the abbot should die of another disease, which the physicians call dysentery; and in this also he was a true prophet, as the event proved. Among others, he told Cuthbert that he should be ordained bishop. When Cuthbert became an anchorite, he would not communicate this prophecy to any one, but with much sorrow assured the brethren who came to visit him, that if he had a humble residence on a rock, where the waves of the ocean shut him out from all the world, he should not even then consider himself safe from its snares, but should be afraid that on some occasion or other he might fall victim to the love of riches.